Chinese sausage is now available at many Costco stores or Asian stores. In a small bowl, whisk the soy sauce with the hoisin and vinegar. Heat a wok or large skillet. Add the oil and heat until smoking. Add the pork and bacon (or Chinese sausage, sliced) and cook over high heat, stirring, until the pork is lightly browned and bacon is crisp, about 5 minutes. Add the minced scallion whites, ginger, garlic and chile and cook until fragrant, about 1 minute. Add the rice, breaking up any lumps with your hands as you add it to the wok, and stir-fry until heated through and lightly browned in spots. Stir the hoisin-soy sauce, add it to the wok and stir-fry until nearly absorbed, about 2 minutes. Stir in the scallion greens, cilantro and pineapple. 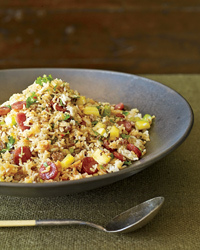 Transfer the fried rice to bowls and serve.